Malalai Joya has been called "the bravest woman in Afghanistan." 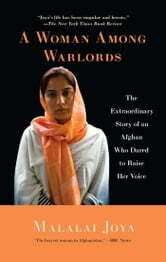 At a constitutional assembly in Kabul in 2003, she stood up and denounced her country's powerful NATO-backed warlords. She was twenty-five years old. Two years later, she became the youngest person elected to Afghanistan's new Parliament. In 2007, she was suspended from Parliament for her persistent criticism of the warlords and drug barons and their cronies. She has survived four assassination attempts to date, is accompanied at all times by armed guards, and sleeps only in safe houses. Often compared to democratic leaders such as Burma's Aung San Suu Kyi, this extraordinary young woman was raised in the refugee camps of Iran and Pakistan. Inspired in part by her father's activism, Malalai became a teacher in secret girls' schools, holding classes in a series of basements. She hid her books under her burqa so the Taliban couldn't find them. She also helped establish a free medical clinic and orphanage in her impoverished home province of Farah. The endless wars of Afghanistan have created a generation of children without parents. Like so many others who have lost people they care about, Malalai lost one of her orphans when the girl's family members sold her into marriage. While many have talked about the serious plight of women in Afghanistan, Malalai Joya takes us inside the country and shows us the desperate dayto-day situations these remarkable people face at every turn. She recounts some of the many acts of rebellion that are helping to change the country -- the women who bravely take to the streets in peaceful protest against their oppression; the men who step forward and claim "I am her mahram," so the fundamentalists won't punish a woman for walking alone; and the families that give their basements as classrooms for female students. A controversial political figure in one of the most dangerous places on earth, Malalai Joya is a hero for our times, a young woman who refused to be silent, a young woman committed to making a difference in the world, no matter the cost.